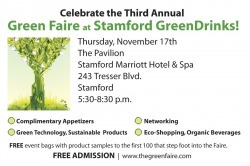 The Fourth Annual Green Faire at Green Drinks was November 16th, 2011 at Grand Restaurant & Lounge, located at 15 Bank Street, Stamford, Connecticut. The Green Faire featured a round table discussion on Connecticut’s Sustainable Infrastructure moderated by Patrice Gillespie of Clean Air – Cool Planet. Patrice was joined by David Kooris of Regional Plan Association and Craig Clark, Program Administrator of Connecticut's Home Energy Solutions Program. Other features included the announcement of the 2011 Green Coast Award winners and eco-exhibits including Sunlight Solar Energy, Easy Care Energy Solutions, Graybar, TALKn GREEN., and GreenTowns. The Green Faire opened at 5:30pm with the Green Coast Awards reception and was followed immediately by the Sustainable Communities Round-Table Discussion and Green Drinks. Guests enjoyed socializing and networking from 6:00pm -9:00pm and learned about how we are transforming Connecticut and creating a Green Infrastructure. CTRecyclingGuide.com, Partners for Architecture, Stamford Green Drinks, Bartlett Arboretum and Gardens, Sustainable Stamford, Live Green Connecticut! and Connecticut Green Building Council. The 5th Annual Fairfield County Green Faire will returns to Grand Restaurant and Lounge. Please join us, Wednesday, November 28th at 5:30pm when the Green Coast Awards will kickstart the event. The Green Faire celebrates the exploration of a new vision and philosophy for the future, capturing the hearts and imagination of all wo attend. Get inspired to live responsibly, and learn how to embrace solutions to the many challenges that we face. Winners of the Connecticut Green Coast Awards will be honored.